A specialty tool for use on all vehicles equipped with Macpherson syruts to rapidly compress the oil spring. To enable replacement of shock absorbers, spring sets, repair bent struts and damaged spindles. Drop forged carbon steel jaws & lead screws (300mm), both heat treated ensure you obtain proessional job performance. Jaws design is fitting to wrap coil claws for safety. Maximum jaw opening is 300mm. 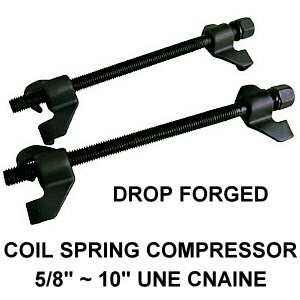 Drop forged carbon steel jaws & lead screws (370mm), both heat treated ensure you obtain proessional job performance. Maximum jaw opening is 370mm. Drop forged carbon steel jaws & lead screws (270mm), both heat treated ensure you obtain proessional job performance. Maximum jaw opening is 270mm. The spindles are equipped with contra-rotating threads which eliminate the risk of slipping round the spring.